If you've been on Pinterest for a while you probably noticed there are pens that look completely different from any other pins on Pinterest - they display the post title and the metadata involved with the post. 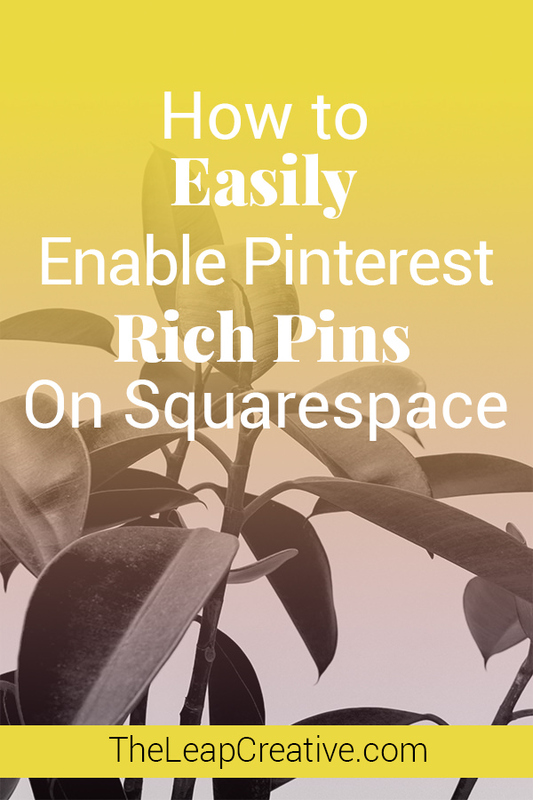 Today I'm going to show you how and why you want to enable Rich pins on your site. 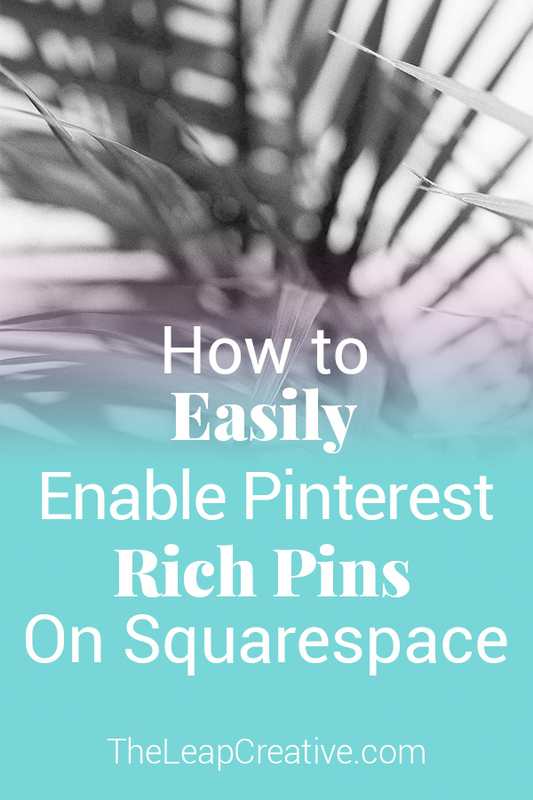 If you're using Squarespace, which come on, you probably are if you're reading this post, you actually have the easiest way possible to enable rich pins. No installing widgets or plugins, no messing around with code -- just read on and I'll show you how to do it. Pinterest displays rich pins differently than normal pins - they include extra info from your website including your favicon, price of a product, and your site’s title and the description for the post you entered on your site. Rich pins allow Pinterest to give their users more specific information about your post to help them choose the right information for what they're searching. These pins are also more favored by Pinterest’s search algorithm. Why do I want to enable rich pins? Rich pins look different, nicer, in a user’s Pinterest feed - and catching the eye of your audience on Pinterest is the important first step of successfully using Pinterest for your business. You also get to beef up your blog post descriptions so you can benefit from better search results with your SEO strategy employed on every post. Standard pins just show the pin image and the title of the post but Rich pins allow you to show your branding, your blog post title, your username and your site favicon. This helps you control the description of the blog post so you can ensure every time it is pinned that it is using the best SEO practices possible and is the most accurate description possible. 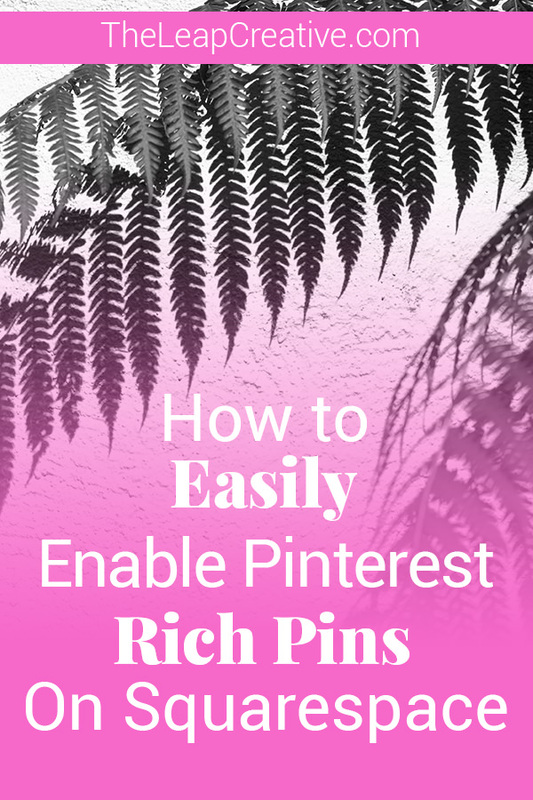 You have definitely seen rich pins before, even if you didn't know it at the time - they can be used with products, articles, movies, recipies, places, and apps. When you click on a rich pin you will see the blog post title, price (if it is a product), the call to action button that links directly to your post or product, the site tile, and the description you created for the post. Here's the part where you'll be thanking your deity that you are using Squarespace. Instead of downloading new widgets and fooling around with updates and code all you have to do is validate your URL with Pinterest! Click Apply Now (you only need to do this once for your whole site to be validated for rich pins with Pinterest). When you are approved Pinterest will show you what Favicon will display, your site name and the website that will be included in each Rich Pin. Squarespace is the best, Pinterest Rich pins are incredibly important, and enabling rich pins on Squarespace websites is really super simple. So your next steps go enable Rich pins on your website right meow! Looking for a deeper dive? Beatriz at Thirty Eight Visuals has you covered! Looking for a partner for your new website? Let's get to work!